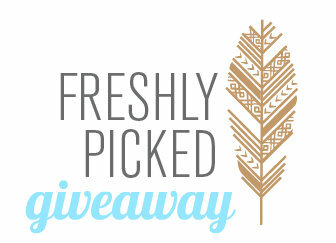 Freshly Picked Moccs Review and Giveaway! A few weeks ago I was sent a pair of Freshly Picked Moccasins to try out. I had heard about their quality and was excited to check it out first hand. I have to say I was very impressed with not only the quality of leather but also the craftsmanship as well! Seriously you guys, these moccasins are amazing! Most of the time I am so busy chasing after my two girls that I don't even bother with shoes because they almost always just fall off but that is NOT the case with Freshly Picked Moccs. These babies stay on! They are designed with elastic at the opening that keeps them in place. No more losing shoes and no more cold feet because a shoe fell off. The moccasins run true to size and go all the way up to size 10 so they are not just for babies, big kids can wear them too. I wish I would have had some when my little ones were newborns too. Okay now that you know how awesome Freshly Picked Moccasins are you can have a chance to win a pair for your own kid! Freshly Picked are my favorite! The only shoes that have stayed on my Scarlett! The radiant orchid are to die for! How adorable! Perfect for my granddaughter! Your girls are adorable and I enjoyed your blogs. Excited for the chance to win some famous Freshly Pickeds!! .....Tracy H.
Your girls are adorable and I enjoyed your blogs. Excited for the chance to win some famous Freshly Pickeds!! .....Tracy H. I would choose the blush color. I love the red mocs! I really like the Prince George moccasins! I'm really torn between the iced mint and the frosted rose! My daughter won't even let me put socks on her feet so I'm dying to try a pair of these! ! Frosted pink ones are adorable! Platinum and Frosted Rose. I love both! Freshly Picked are so gorgeous! I don't own a pair but I've wanted to for a while. I think my daughter would look adorable in the pale pink. Thanks for the giveaway! I love the frosted pink ones too! They would look adorable on my little 8 mon. old and LOVE how you described them featuring the elastic in place to help them stay on! I love the red---Go Utes or Cards! The blush colores moccs are absolutely adorable!! Me and Robert Olsen love all of them. Count me in on this giveaway.. I love the heirloom limited edition. The mix of metallic and print is perfect! I love the platinum moccasins! All the colors are my fav but my fav fav is cherry and ivory !! Love platinum. Goes with everything! So so cute! I've been dying to try freshly picked! My fav is the gold! Thx for the giveaway! I love the coral ones! So perfect for spring and summer! I want the camo print! I love the weathered brown and the camo!!!! !